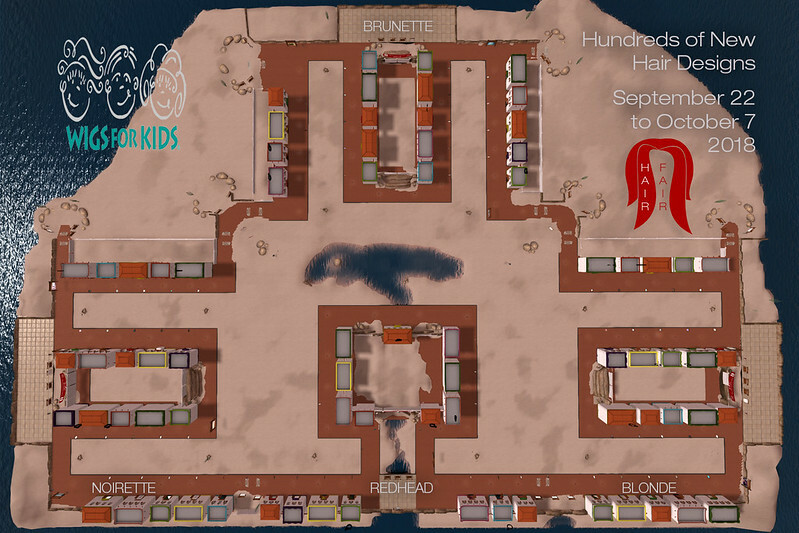 A big thank you again to everyone involved in this years and past years Hair Fairs in Second Life. We appreciate everyones efforts, from customers, to creators and the wonderful people at Wigs for Kids for doing all they do. We are honored to be able to help in the way we do each year. There are a few days left for Hair Fair 2018 and it has been an exciting event. We made a few changes and tried a few things, and we are extremely happy with the outcome so far. We started with a raffle that gave everyone in world the opportunity to win early access to Hair Fair. Previously the only way to obtain that as a VIP was through our photo contest, but we came to realize that not everyone is a photographer — but most love hair! We did not want to exclude people, so we came up with a new idea, and it worked great. It also meant people visited the stores of our participants in advance of the event. We moved the events time of year to September. This is not the first time it has been at this time of the year, and the move was based on a few different variables. With so many events around Summer and the fact that many people either go away, or have very big RL commitments in the summer it was putting a lot of added pressure on the designers, and some were not able to participate, so we tried Fall (we had done this in the past) to see if that made things better. We did find that a lot of our visitors missed the event being in Summer, so we plan on discussing that with our participants for the future. Also in the theme of relieving some of the pre-event pressure, we decreased the minimum styles per booth to 2 instead of the previous 3 and also added to the maximum to make it 6. This means if you were wondering why there seemed to be less hair in some booths than usual it was true 🙂 there was. We took a little off the top! Then we added facial hair and hairbases. We previously had not allowed them as individual items, as it was hard to authenticate what was created by the seller, but with mesh heads now truly being a big deal and it is very obvious who is creating what, we felt that it was time, and that has gone really well and we have been really lucky to have such wonderful creators join the event through that. We look forward to seeing more in the coming years. Collaboration guests was also a new concept — as some people really like working with others and seeing how much further their styles can go with another designer in their booth with an item created to enhance the look of their hair. The item had to be standalone and the hair also had to be so that the focus was still hair. We hope that given more notice on that as a concept it will grow to bring in more guests in the future. Let us get to some MVPs! These are people that do a lot of things behind the scenes for us as an event, and without them it might just be me sitting in the middle of four sims bald with one left shoe. 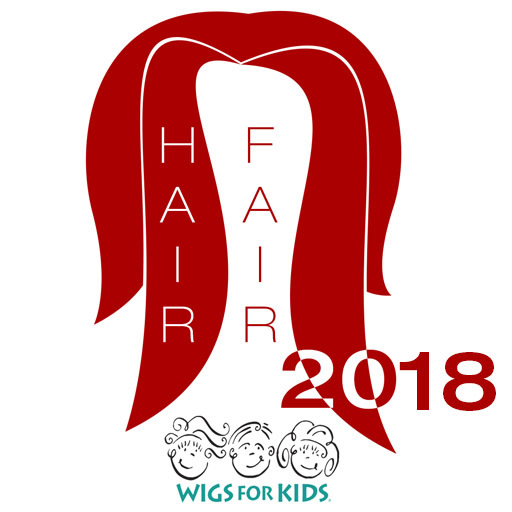 These creators make some amazing styles to showcase their talents at this event, and pay to participate to cover all costs of the event set up, and then donate a percentage of their sales to Wigs for Kids. They set up their booths to be as eye-catching as possible while also obeying some very strict lag mitigation rules. They promote, entice and just generally come together as like-minded creators to see their work benefit others. We truly appreciate all they do as part of this event. There are stores that set out to participate but due to RL matters are not with us at the finish, but we are very grateful that they are with us in spirit and their enthusiasm to participate in the event helps it go forward. We are very glad that we are able to invite the support staff of the designers into our group leading up to the event, as it is very helpful to have them on board. It means that the designers do not miss things, or in some cases they are able to do things for us so that creators can focus on creating. We have met some wonderful support teams over the years, and we are very happy to have them be part of the event. Every year we comb hundreds of blogs to grab as many as we can that will help us spread the word about this event. They cover promotions, such as this year’s raffle, the bandana kits info, the demo group and the opening day. This is something they do, not only supporting the great hair creators in the event but also to help us help Wigs for Kids. The event does not send bloggers packs out in the group; bloggers buy the hair that they wear or arrange with designers privately to receive items to blog (but that is not a given). They come early and they post as much as they can, to ensure that their readers know as much as they can leading up to and during. Some of them even make and donate bandana designs that are sold at the event. They shoot video footage, do blog posts, Flickr and social media announcements that help us make sure that everyone knows what is going on and we are very thankful for their efforts. They are always so excited to be Early Access Bloggers and we are very thankful for their assistance. All the efforts of all Bloggers that cover the event, post on hair that is at the event, and just generally encourage their readers to attend we are very grateful for. It is a joy seeing posts all over the feeds, and Flickr as well as Social Media that have been so positive about Hair Fair, so thank you also for your efforts. We have a few very specific Lindens to say thank you to this year, and while I am not sure on the policy of naming names, I am going to take a plunge and go for it. Thank you Patch, Keira and Madori for helping us with the Sims that we are using this year. Minutes before setting up I think I broke three of them and they were all very supportive in helping me unbreak them. Xiola for her efforts in showcasing the event on Social Media and just being really so cool in general. Brett for making sure all went well with getting the event on Destination Guide, which really helps residents find us. Then on top of that all the other residents that just make things not go boom while we have this event going, and encourage people to support such great community efforts going on all over the grid. If you are a Firestorm user you will have seen Message of the Day announcements during the event letting you know that the event is on. We are one of many announcements, and we are very appreciative of the time that is given to our event and that of all others because without these MOTD posts a lot of information would not get across such a large group of Residents as it does. Firestorm definitely enriches us as a community and 8 years strong they really do go above and beyond. A great group of hair lovers that post notices not only about Hair Fair but creations that are released all year long by Hair Designers from all over SL. If you are a hair fan this is the group for you. We really are happy that Hair SL promotes us through their group, and appreciate all they do all year round for hair lovers. Such wonderful efforts from residents from all over SL, those that decorate the ones provided and those that on top create their own style and are trusting in us enough to give it full perms for us to sell. 100% of all Bandana sales goes to Wigs for Kids and it is such a fun way to participate in the event as a non-hair creator, we really love the stories shared and the insight into the community through the bandanas made. Last year we launched the Hair Fair Hares that Anya Ohmai created for us. This year they have been very popular again, and we want to thank her for allowing us to have them each year going forward as an alternative for those that want something huggable or rezzable to commemorate the event. Mel Vanbeeck does all of the scripting associated with Hair Fair. This year adding to that with the raffle machine and ticket dispenser. He has created the buses that are used by people to navigate the event, and the donation scripts and anything else we need. He does the maps of the event, and also creates the pathways and the layout math needed to make sure everything is as easy to navigate as possible. He is also my rock, my anchor and everything else that keeps me connected with the ground during the organisation of the event. Whimsy Winx is the creative genius behind our landscaping and vignette displays that decorate Hair Fair year after year. What she can do in five minutes with her inventory blows me away each and every time. If she doesn’t already own it, she usually has it favourited or remembers that she saw it once before (then makes sure I remind her where). She helps coordinate the designers through the demo group, ad spaces and anything else that is needed to be done to get the event up and running. Ashia Tomsen always eager to help with what needs doing has come in and given a helping hand on many of the duties involved in running this event. Whether it is searching something out, contacting VIPs and sending out invites, and keeping this up to date. I am so grateful to them all, and how they help make this event one of the best things to be a part of year after year. I am truly lucky to be part of such a rich mixture of talent both within the committee and all the people throughout the event that make it so great. I would also like to thank our builder of the booths who this year is not publically available but turned into a reality what we had envisioned the event to be, and it made it incredibly easy for Whimsy to build on top of that style. I also want to thank everyone that visits the event, or mentions it to others and generally shares what we do with the Second Life community. It is through your generous spirit that we are able to help Wigs for Kids each year, and they are also very thankful to you for your efforts. There are no Fees to join the Hair Fair Demo Group. There are also no groups to join for any other incentives to the Fair, do not accept group invites while attending the event. We do not spam invitations to anything. Each Sim is named after a hair colour. This may help you with navigation and knowing where you left off when visiting the event, or sharing information with others. All logo boards at the front of each store are named with the hair store name. If you have hover-tips active in your viewer settings, this will allow you to mouse over boards to see which is which if textures are slow to rez. Each sim has visibility turned off, which helps with lag and how much you have to render, so do not panic if you land and cannot find your friends — they may just be on another sim. There are two additional sims for cam shopping with very little on them to load. If you follow the paths of Hair Fair you will visit each store on every sim, so start in one direction and you will end up where you started. All packs have scripts that will redeliver if you did not get the item when purchased. There is a limit of how many purchases each script can keep track of before your transaction falls out of the log, so be sure you check you have a purchase when you buy something. If you try and buy it again it will redeliver as well as refund you, but it is simpler to just left click on the pack you purchased to receive a redelivery. If you still have trouble, try relogging and check transaction information and contact the seller of the hair you purchased. Every pack of hair sold at hair fair donates a minimum of 15% if no sign stating a percentage it will be the minimum. Bandanas and Hair Fair Hares donate 100% and any donations made to the kiosks around the event are 100% donations. It may have a mix of both male and female styles, unisex styles or male only, but check them all, as the symbol is just to make it easier. We would like to thank all that entered as well as all the stores that provided machines for people to get tickets from. The final list of winners are below, and we have contacted them all in world and they will be able to visit Hair Fair 2018 on the 21st with a friend. We hope to see the rest of you on the 22nd of September through to the 7th of October. Hair Fair Second Life Create a free website or blog at WordPress.com.